© 2001 Andy Warhol Foundation for the Visual Arts/Artists Rights Society (ARS), New York. Photograph by R.H. Hensleigh. Andy Warhol is known for announcing the fact that everyone should be famous for fifteen minutes. Indeed, fame was what drove Warhol. He cultivated it by his spectacularly cool persona, surrounded himself with famous people, and depicted fame in picture after picture of Hollywood celebrities, political figures, chic fashion personalities, rock musicians, well-known socialites, and star athletes, such as Portuguese soccer star Pele featured in Edson-Pelé. Andy Warhol was possibly the most important twentieth-century artist ushering in the era of postmodern art with its detached and ironic play of appropriated signs. He predicted the mass media’s effect on society in pictures drawn from the exploding media culture around him. Displaying car crashes or electric chairs in repetitive serial fashion, Warhol demonstrated the anaesthetizing effect of seeing a tragic image over and over again. Similarly, the endless Coke bottles and Campbell’s soup cans underscored the celebrated sameness and banality of the consumer culture in rapid growth. Warhol identified fame as an end product of media entertainment. From Marilyn Monroe to the FBI’s Most Wanted list, all fame was equal, Warhol declared. When Valerie Solanis shot Warhol on June 3, 1968, she claimed she did it because he had too much control over her life. Warhol died almost twenty years later, but the control Solanis objected to was exactly what interested Warhol in his life study of mass culture. Andy Warhol was born Andrew Warhola to Czech immigrants in Pennsylvania. He grew up in a Catholic household in Forest City but quickly tuned in to American popular culture. He recalled, for example, drawing at an early age by copying Maybelline ads of Hedy Lamarr. In 1949, Warhol graduated from Carnegie Tech with a graphic design degree and moved to New York City where he became a highly successful commercial artist working for such companies as I.Miller shoes, Glamour, Tiffany’s, and Doubleday Books.He was always aware, however, of the avant-garde art scene, in particular the work of Robert Rauschenberg and Jasper Johns, and in 1960, decided to become a serious artist. Warhol took on the classic subjects of Pop: comic book characters, consumer products, newspaper advertisements, etc. He began with a painterly kind of rendering following, in part, the model of New York’s abstract expressionist movement, but quickly turned to silk screening which gave him a more detached, mechanical, anti-expressionistic effect. Warhol went on to create the well-known Disaster Series, had a foray into film-making, did cow wallpaper as art, and created one of the hippest scenes in New York at his studio called The Factory. He became incredibly famous and in turn devoted his artistic attention to portraits of famous people. The Edson-Pelé work is from a series of star athletes including Dorothy Hamill and Muhammad Ali from the late seventies. The style, however, is one he began in the early seventies when he introduced a looser, more brushy kind of painting in addition to the silkscreened image. Warhol would begin with snapshots of the famous personality under study, then convert the best one into a high-contrast photo silkscreen. 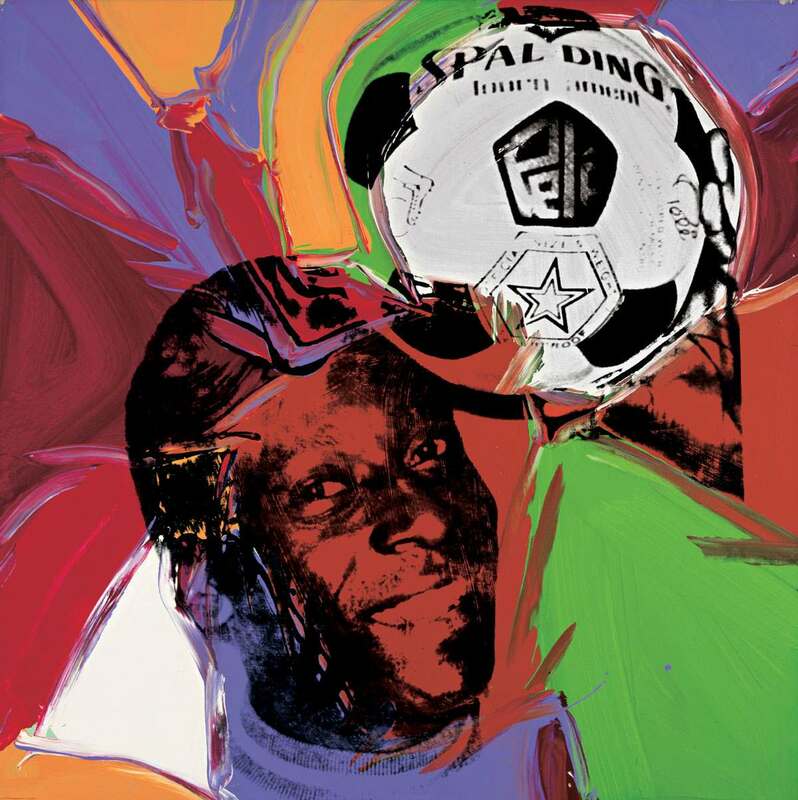 He would then print onto a canvas already prepared with the brushy surface and add more paint if deemed necessary.The style is wonderfully effective in the Pelé portrait where the vibrantly colored passages of paint reverberate around Pelé’s head as if released on contact with the soccer ball. It is a flattering portrait paying homage to one of the most talented athletes of the day and to the brand “Spalding” that features large in the composition-Andy Warhol never hesitated to fix on the reality of our post­ industrial, consumer age.